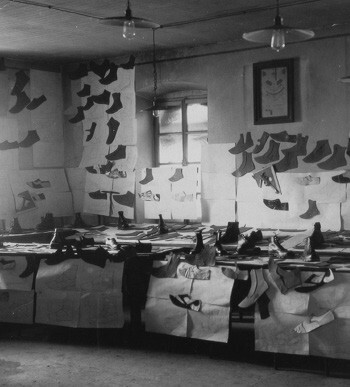 the demand for boots increased, obliging Narciso to hire new workers: the good name of "Calzoleria Sportiva" crossed the boarders of the valleys and reached the cities of Trento and Bolzano. his son Francesco began to work for the company, and by doing the right thing at the right time he started building a new workshop on the outskirts of Tesero, where today is located a large industrial area. 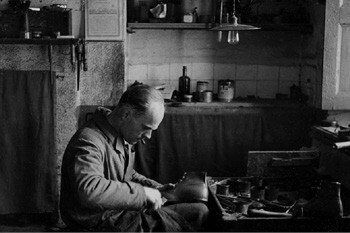 In the new and roomy biulding they began to design and develop ski boots, for a fast growing sport, requiring more technical boots. 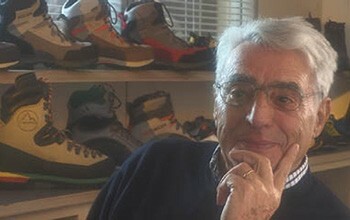 The market opened up quickly and Francesco Delladio introduced the brand name "La Sportiva" firstly in the Milan Exhibition, then throughout Europe, with a winter collection characterised by audacious technical and aesthetic solutions, and a summer collection of traditional mountain boots. 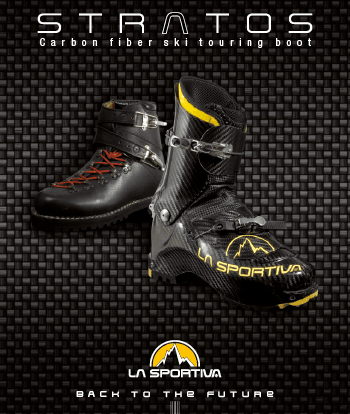 with the arrival of plastic boots, "La Sportiva", after a trial season, had to discontinue the production of ski boots, for financial reasons; the investment would have been too high and therefore the production was limited to mountain boots and cross-country skiing footwear. In the meantime the sons of Francesco began to work in the company: Lorenzo, Luciano, Marco. The desire to create, to stand out and to make a name for oneself in an ever increasing market is a characteristic present in the Delladio family. the focus of the firm moves towards the climbing sector due to an intuition which will prove to be a winner. An innovative shoe characterised by the colours purple and yellow was devised and produced to become the forerunner of a long series of avant-garde products, which very quickly will seal the success of the brand name world wide. 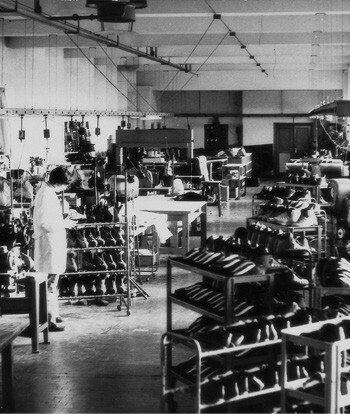 The footwear manufacturer "La Sportiva" became a Ltd Co, owned exclusively by the Delladio family; very courageous technical and commercial solutions were studied and evaluated, that were optimised in a short time. 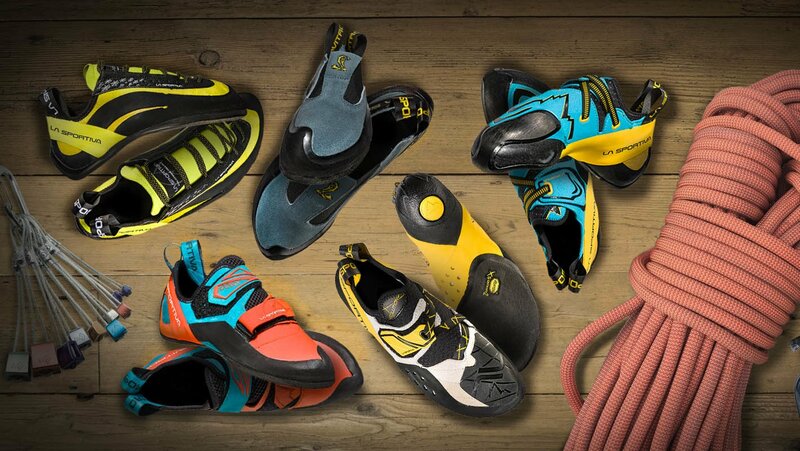 50% of the firm’s independent distribution “La Sportiva France” is acquired and this allows for an increase in the penetration and control of the French market, considered fundamentally important. With the same spirit, the Delladio family realised that the factory in Tesero was too small to cope with the ever increasing worldwide demand, and they decided to build a new,larger and more functional factory. 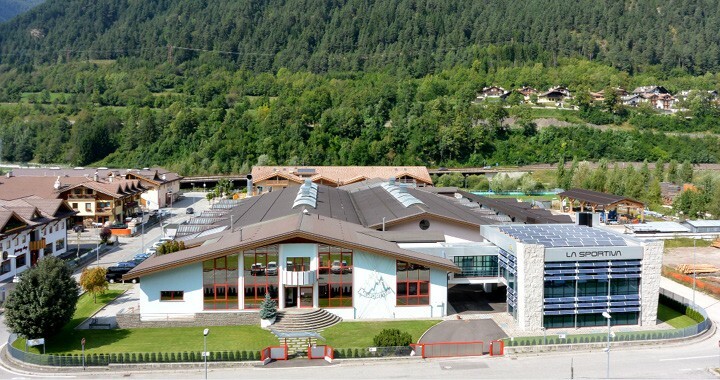 In September the Company moved into its new and modern factory located in Ziano, at the foot of the Trient Dolomites, in the North-Eastern part of Italy. The new facility in Ziano confirmed the expectations of the Delladio family. The turnover was growing and the sales rose by 13% over the previous year.The productivity of the Company continued to be excellent. Export confirmed to be higher than 75%. During 1997 Luciano left the family company.The objective of Quality System Certification is attained according to the Uni Iso 9002 norms. The awaited technical/commercial support, expected after the fusion with "The North Face" didn't work because of continuous changes of top managers in various Research and Development American Departments. At this point the Delladio family didn't have the same people, with whom the agreement had been signed in June 1998, as interlocutors any more and at the same time they didn't share the new strategies of "The North Face". Therefore they felt that the best solution would be to ask for a cancellation of the agreement. After a careful evaluation of the situation "The North Face" has accepted it and now La Sportiva will proceed with the draft of the corresponding documents. The end of the operation of "La Sportiva" purchasing back the shares from "The North Face" is expected within the end of January 2000. 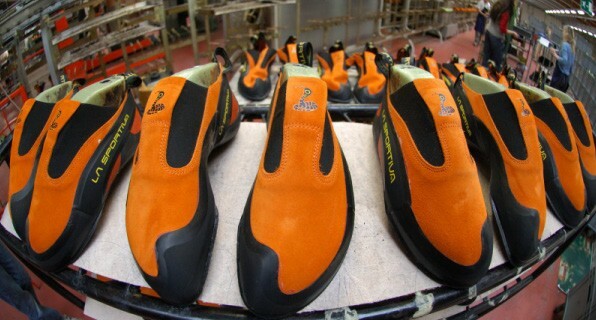 The increasing demand for technical mountain products, with La Sportiva logo, was a reason for the owners to decide to invest in new spaces, in new machineries and additional employees. Consequently a new building has been purchased, and then connected with the existing structure by an underground tunnel. State-of-the-art machineries have been acquired. Several new employees have been hired. Mister Lanfranco Brugnoli, a person with great administrative experience, has become part of the organization, and he has been appointed Administrative and Financial Director. We must point out the big commitment that was undertaken to convert the old system UNI EN ISO 9002: 1994 with the new updated UNI EN ISO 9001: 2000, integrating it all with the Environmental Management System UNI EN ISO 14001. 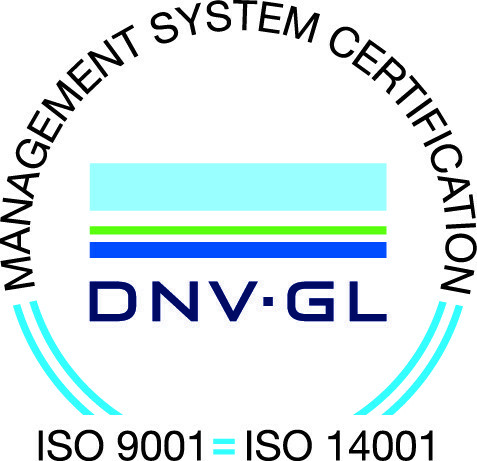 The final inspection conducted by the certifying Body DNV is expected within February 2003. 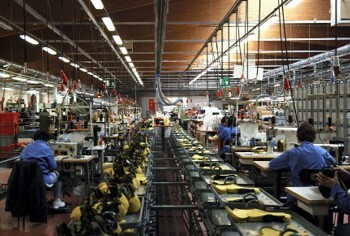 This engagement, unique worldwide until today in the shoe manufacturing / outdoor sector, demonstrates the commitment of "La Sportiva" for issues regarding both Quality and environmental impact and respect. Two difficult years for the entire market world wide. 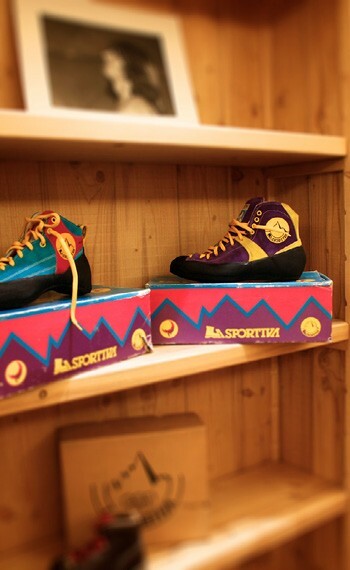 Two years during which „la sportiva” reacted with courage and determination maintaining their sales figures in every single country and in some cases even increasing them. The increased sales turnover was 6% compared to 2003, a result which satisfies the management, even if the initial aim was higher, but the worldwide, negative events which occurred during this two year period, did not permit the predicted growth. Large investments are foreseen for the year 2006 for research and development and marketing. These two projects will definitely bring an increase in sales with the consequent increase of internal personnel, benefiting local employment. 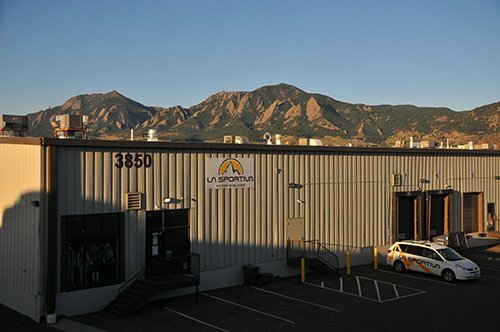 BOULDER, CO, January 17, 2006 – La Sportiva, a leader in outdoor footwear, announced that its North American distribution operations have become part of La Sportiva’s unified global distribution consortium. 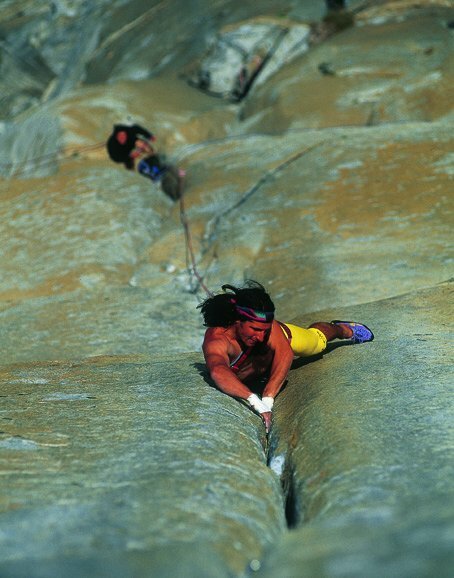 As of January 1, 2006, La Sportiva S.p.A., the Italian parent company and manufacturer, and La Sportiva N.A., Incorporated merged in a cooperative effort to support La Sportiva’s brand strength with their customers who continue to benefit from their expertise in mountain specialty products delivered with the quality and innovation that are the trademarks of the La Sportiva brand. Ziano di Fiemme, January 2006. 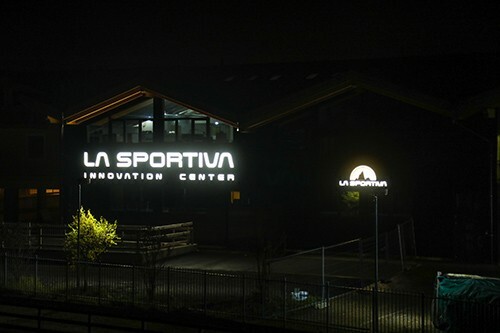 La Sportiva N.A. 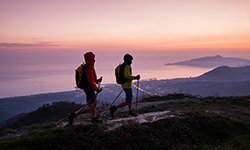 announced a 30-percent growth in preseason sales from S05 to S06 with a considerable spike in the trail running category. What’s more, the Leisure Trends Group recently reported that La Sportiva dominated the U.S. climbing shoe market in 2005 with over 35-percent overall market share and a staggering 65-percent market share for price points over $100 for ten month sales from January 2005 through October 2005. La Sportiva continues to clearly dominate the mountaineering boot segment with a 65-percent market share for the same period. The success the brand is having in the North American market drew the attention of La Sportiva Italy and translated into the new partnership structure. By aligning the North American operations with the global brand, the company will achieve considerable synergies in its marketing, product line management, R&D, and finance operations. New access to expanded resources from the Italian parent company is expected to fuel exponential growth in the coming years. The La Sportiva N.A. operations recently restructured its research and development functions to sharpen its focus on trail running and light hiking markets. 1. The research and development department was enriched with new techniques. 2. Large investments in machinery and technology were made in the production area. 3. New staff was recruited to the benefit of local employment levels. 4. An internal marketing department was created with two people responsible for communication and public relations. 5. The commercial sector was completely revised and strengthened with the introduction of two staff members with wide experience of the outdoor world: an export sales manager and a sales director for Italy and bordering countries. 6. The sales turnover increased considerably. 7. The export quota reached a figure close to 80%. The year closes with a higher-than-projected sales growth rate. Exports consolidate at around 80%. The new sales staff give fresh impetus to business and with the support of the marketing department are able to meet and exceed sales targets without compromising profit margins.The R&D department work in an exemplary manner and the new products arouse the client’s interest and admiration.New products like Solution (climbing) and Fireblade (Mountain Running) receive important recognition from prestigious specialist magazines. Production numbers continue to increase with the aim of satisfying market demands, while at the same time guaranteeing the highest qualitative standards. 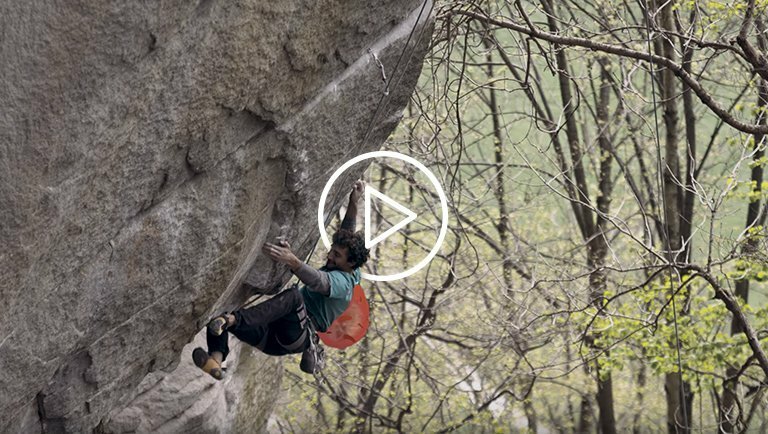 La Sportiva’s climbing team reaches new heights: victory goes to Patxi Usobiaga in the World Cup Difficulty and to Kilian Fischhuber in the World Cup Bouldering. Further success comes from the world of Mountain Running with first place in the Italian championship awarded to Fulvio Dapit. 1928-2008: 80th anniversary! It will be a year to celebrate the company’s 80th anniversary A line-up of special, exciting events are in store. 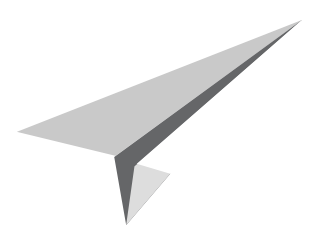 The birth of a new project concerning a different market sector. The signing of an important business agreement by which La Sportive becomes the exclusive european importer of the Canadian technical clothing line “Blurr”. Regardless of the global financial crisis, our company has responded swiftly and positively to the adverse conditions. 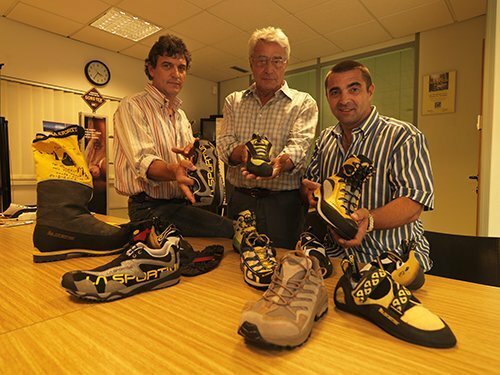 The implementation of a series of effective sales and marketing strategies assured that La Sportiva “closed” the 2009 financial year with a positive operating result and an increase in turnover of 14%. Our new mountaineering products contributed to this success by gaining leadership position in their specific product categories. In particular the new carbon and titanium, ski mountaineering boot Stratos has allowed the company to enter the ski mountaineering sector as market leader. The Canadian brand “Blurr” has been introduced to the outdoor market through leading European outdoor retailers. Growth in sales continues: turnover has increased 15% compared to last year, in contrast to global economic trends. The company leaders believe in investment and have therefore been able to provide the sales-force with a new, innovative and uniquely avant-garde collection. A new collaboration with the Korean multinational electronics company “Samsung” has begun. This is the start of a strategic plan which, within a year, will lead to the creation of a new collection of technical outdoor clothing. This collection will accompany the existing ski and mountaineering range of plastic boots designed to complete the ski range launched last year, including the carbon boot “Stratos” and a state-of-the-art range of technical skis , bindings and accessories. To meet the needs of this new product expansion, the company has acquired new work space. The finished products warehouse has been doubled and work has begun to build a new accommodation to house the sales and marketing offices. The company has also made important investments in consideration of environmental impact: new active carbon air filters have been installed and the proportion of product recycling has been further increased. Despite the global economic crisis, the year closed with extremely positive results for us. In fact, compared to the previous year, 2011 recorded an 11% increase in turnover. During the "international sales meeting", the new project was presented to the sales force, a range which is entirely dedicated to the world of ski mountaineering. It comprises the new Spitfire, Sideral and Starlet boots to accompany the prestigious Stratos model; a complete range of high performance skis; the latest generation of bindings and ski skins; and the long-awaited technical winter clothing line. In April, a new company "Fujan La Sportiva" was founded in collaboration with a Chinese manufacturer who has been producing the mountain running line for La Sportiva for more than 12 years. This strategic business venture will provide a more enhanced service to the Chinese market. A new building to house both companies is currently underway. This will be completely autonomous and will be equipped with photovoltaic planet heat pumps. At the same time, plans are underway for the development of a larger production site and the addition of a new production line. 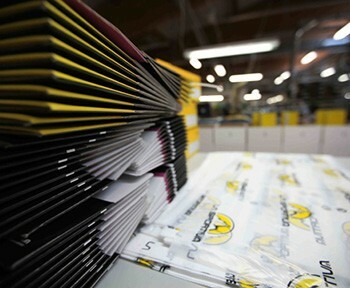 La Sportiva continues to react dynamically to the persistent global economic crisis. The year 2012 ended with a double-digit increase in sales and a marked a firm consolidation in the clothing sector with a new line of articles dedicated to winter ski touring, a comprehensive collection of technical leaders dedicated to mountain running. The footwear segment, the company’s core business, saw the introduction of a number of new items which were highly appreciated by the clients during the trade fairs in which the company participated. In January, the new office block became operational allowing for enhanced space for the sales and marketing department and product showrooms . The entrance hall has also been completely renovated both internally and externally , while the study proceeds for the expansion of the production area which in 2013 will provide a substantial increase in the production of technical footwear . Since January, the supply of electricity now comes from 100% certified renewable sources. La Sportiva continues its growth both in turnover and brand awareness: today La Sportiva is no longer "just" a shoe factory but a 360°outdoor brand. The company premises in Ziano di Fiemme have been further expanded to provide more space for inventory management which is has been incorporated into a new basement adjacent to the factory. The company has also experience great satisfaction for the awards received in recent trade fairs - Outdoor Show (Germany) and OR Show ( USA ), where the innovative model "Trango Cube"set new levels of performance and high technology in the mountaineering / hiking category. 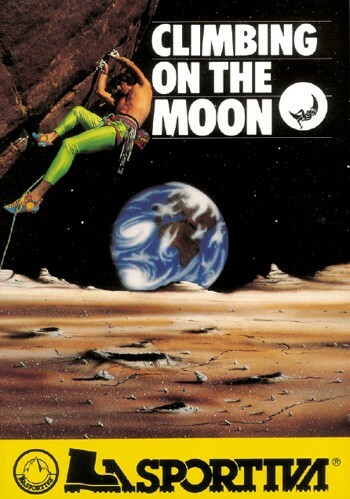 The 2013 summer season saw the official release of the first clothing collection dedicated to the world of climbing. The collection will be delivered to the market and end consumers for spring 2014. 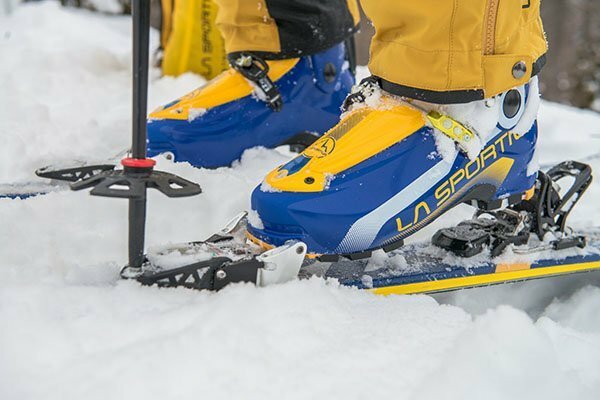 In the ski alp segment La Sportiva made a favourable impression on the market, with the introduction of a line of technical apparel and two new 4 hook boots, Spectre and Sparkle , dedicated to free-ride ski mountaineering . 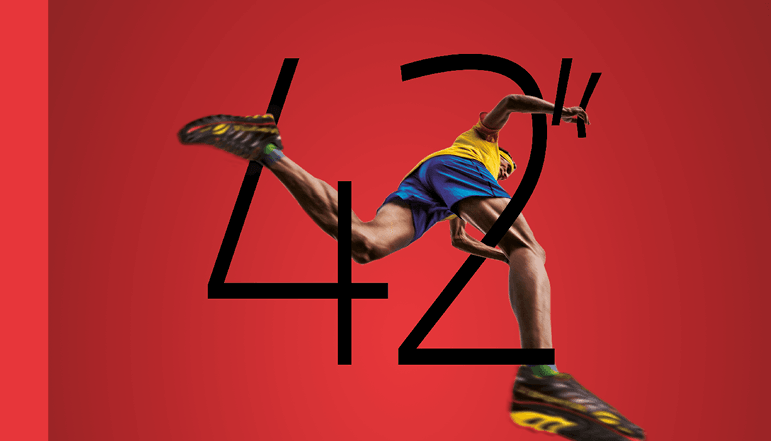 In race championships the French athlete William Bon Mardion (part of the La Sportiva team), won the world championships with the "Stratos Cube" model at his feet and the video "Working class hero" is specially dedicated to him and the values he represents. The company’s constant commitment to investments in terms of space, state-of-the-art machinery and personnel means that the year 2014 will also see an additional double-digit increase in sales. In order to respond to the increasing socio-economic attention paid towards clear and transparent behaviour, the company adopts the ''Code of Ethics'', which contains the principles of fairness, honesty, integrity and transparency. In relation to this, the Company appoints its own Supervisory Board. 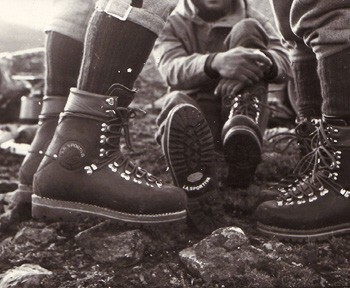 The new "Mountain Hiking" boot line is presented using the Gore-Tex Surround product technology. The Outdoor trade show brings immediate success and a special award to this new product category for La Sportiva. Urban Zemmer is the world's fastest man in the vertical discipline, with a time of 29’42” wins the World Championship in Switzerland. Zemmer uses the Helios SR model and wears La Sportiva technical race gear. 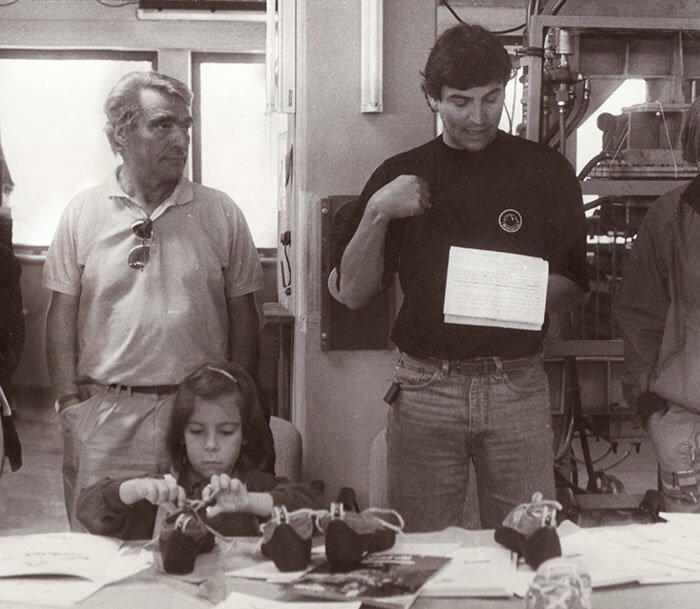 2015 was a year of deep sorrow following the death of Francesco Delladio, President of the Company, father of Lorenzo and Marco and grandfather of Julia. Francesco passed away on June 29th, at the age of 88, after a lifetime of work and sacrifice but also of great satisfaction. 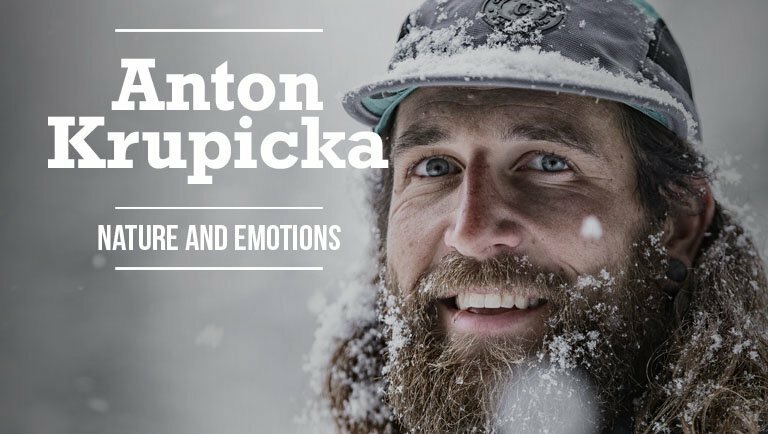 He leaves a successful, international company in the hands of his children, a company that is today a world leader in several sectors of outdoor sports. 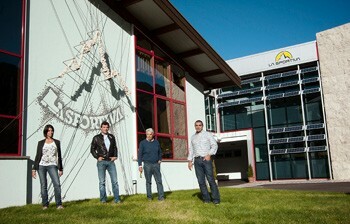 Lorenzo Delladio was elected the new President of La Sportiva Spa, while also maintaining the position of CEO. Giulia Delladio and Lanfranco Brugnoli became part of the CDA. 2015 was also a year of great achievements in terms of revenue growth, which again showed a two-figure increase. 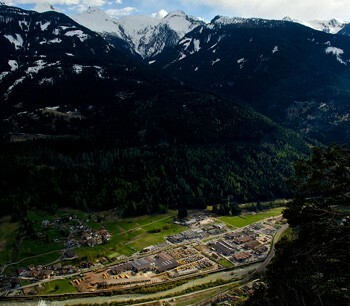 The clothing lines were increasingly in demand and appreciated, and it proved necessary to have them managed by an external logistics structure as the spaces in the warehouses of Ziano di Fiemme were undersized compared to the growth. Work also began on the construction of a new building that would be entirely dedicated to the research and development of new products. The company won many awards in different categories: the extreme mountaineering product G2 MS was voted best outdoor product at the 2015 ISPO Munich trade fair, in terms of marketing the Italian outdoor sports system stores voted the La Sportiva packaging as the best on the market and acclaimed two digital marketing campaigns as the most effective in communicating the product. 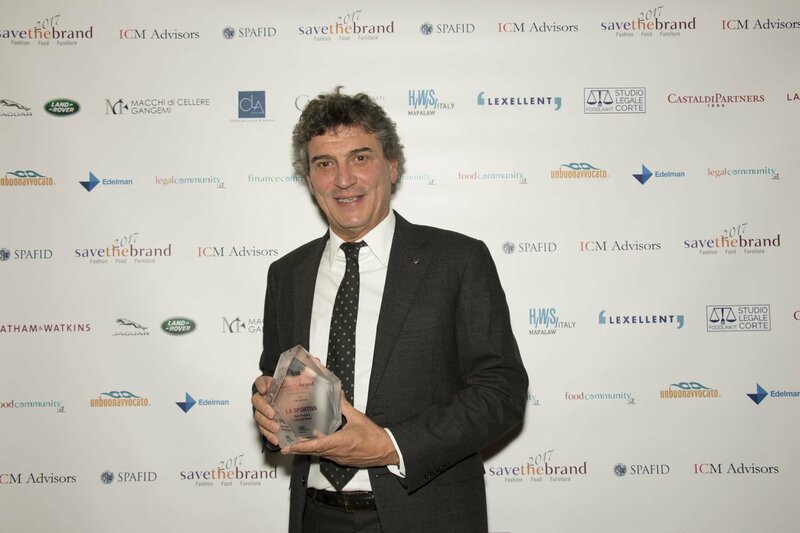 At year end, La Sportiva also won the "Save The Brand" award for the company that has most distinguished itself in its internationalization capabilities in the areas of 3F (Fashion, Food, Supplies) among the excellence of Made in Italy. 2016 has been a very positive year for La Sportiva, whose turnover confirms a double digit sales growth. 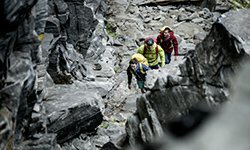 There continues to be a strong demand for the clothing lines that are now positioned alongside the consolidated footwear lines in the Mountainwear collection. The positive trend continues again in 2017, turnover and exports grow beyond the budget set at the beginning of the year, thanks to the new models introduced and the expanded sales/marketing department. The Brand’s international leadership position in various product lines is also growing. 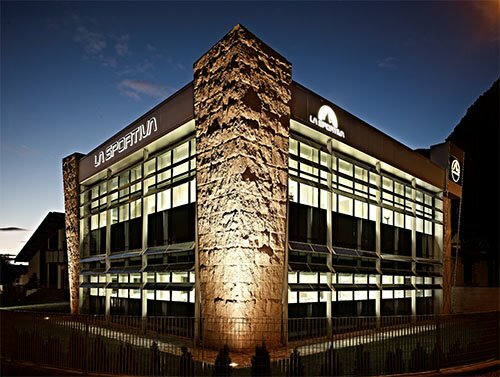 It is a year of great changes within the social structure: Lorenzo Delladio acquires his brother Marco’s shares, becoming sole owner (100%) of La Sportiva Spa. A mutually agreed step, conceived with a view to unifying and developing the Company. The company receives two awards from the market: The ‘’Save the Brand’’ prize awarded in Milan to the most deserving Made in Italy brands for Digital Experience activities over the internet and the official mention in the ‘’Compasso d’Oro International’’ catalogue in the “Sport-Performance and Innovation’’ category with model Stratos Hi-Cube, made in carbon with aeronautical technologies. On the retail side, the company’s mono-brand continues with the new brand-store In Rodellar, Spain, a symbolic location for world climbing. 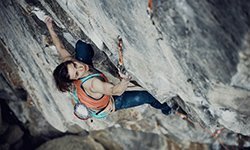 In the field of performance La Sportiva athletes achieve two record-breaking results: Adam Ondra completes the first 9C in the history of climbing in Norway and Angela Eiter achieves the first female 9b in Spain. Investments: The office building has been expanded and is now more spacious and functional is and work begins for the construction of a new production plan adjacent to the existing one. On a surface of 5.100 m2 a production space will be built providing parking space for employees in the basement. The end of construction is scheduled for the end of summer 2018. The year closes with the publication of the company’s first “sustainability report”, a document containing all the activities put in adopted by the company in favour of environmental and social respect and eco-sustainability as well as transparency towards its stakeholders”.